Product prices and availability are accurate as of 2019-04-22 04:56:56 UTC and are subject to change. Any price and availability information displayed on http://www.amazon.com/ at the time of purchase will apply to the purchase of this product. 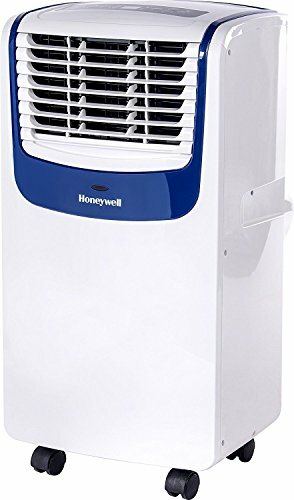 Stay cool and dry with the Honeywell MO series compact portable air conditioner. This 3-in-1 unit helps you cover all bases with AC cooling, a multi-speed fan, and a dehumidifier for indoor spaces up to 350 square feet. Designed for portability, Honeywell's MO series will save you money on energy costs by cooling only the rooms you are using instead of the whole house. This compact unit is one of the lightest air conditioners in its class and comes with smooth-gliding wheels that make sliding it from room-to-room a breeze. It also comes with a flexible exhaust hose and a window-venting panel to get it set up and running quickly. At the end of the season, simply roll the AC into a storage room until next time you need it.